Coup d’Etat: The Overthrow of an American President ($20, ISBN: 978-1-937536-82-4, Hardcover ISBN: 978-1-68114-130-5, LCCN: 2014949613, 6X9”, 126pp, August 2014, purchase on Amazon or Barnes and Noble): is dedicated to all those who believe the real truth behind the JFK assassination has been ignored, or worse, covered up. This project is my attempt to answer three basic questions: Why was President Kennedy assassinated? Who benefitted? And who had the power to cover it up? 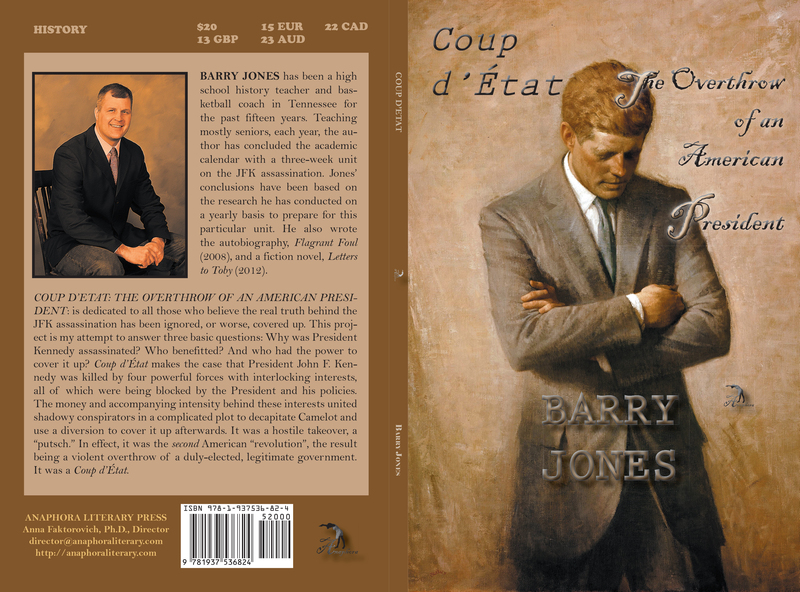 Coup d’État makes the case that President John F. Kennedy was killed by four powerful forces with interlocking interests, all of which were being blocked by the President and his policies. The money and accompanying intensity behind these interests united shadowy conspirators in a complicated plot to decapitate Camelot and use a diversion to cover it up afterwards. It was a hostile takeover, a “putsch.” In effect, it was the second American “revolution”, the result being a violent overthrow of a duly-elected, legitimate government. It was a Coup d’état. Barry Jones has been a high school history teacher and basketball coach in Tennessee for the past fifteen years. Teaching mostly seniors, each year, the author has concluded the academic calendar with a three-week unit on the JFK assassination. Jones’ conclusions have been based on the research he has conducted on a yearly basis to prepare for this particular unit. He also wrote the autobiography, Flagrant Foul (2008), and a fiction novel, Letters to Toby (2012). Are you planning to write any more JFK books possibly based on new information? As a matter of fact, I just did. Two of them in fact.